One type of figure I always wanted from the ARAH G.I. Joe line was red ninjas. Even though Hasbro did produce some of them starting in 2004 or so in the Valor VS Venom line, the first few versions were just repaints of old Storm Shadow molds, with rather uneven results at times. 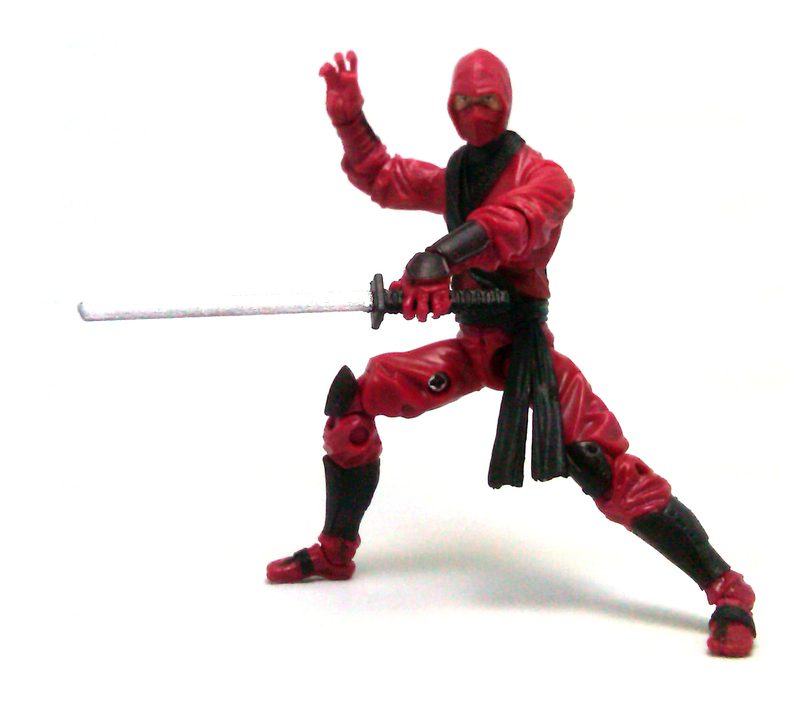 Following up with that tradition, the new Red Ninja released for the upcoming G.I. Joe: Retaliation movie is also a repaint of a preexistent Storm Shadow figure, the version from the G.I. Joe: Renegades line, and I have to say that I am mostly happy about how things turned out. The sculpture is really excellent, as the red costume is gorgeously detailed and even the small amount of face visible behind the mask shows a lot of character. 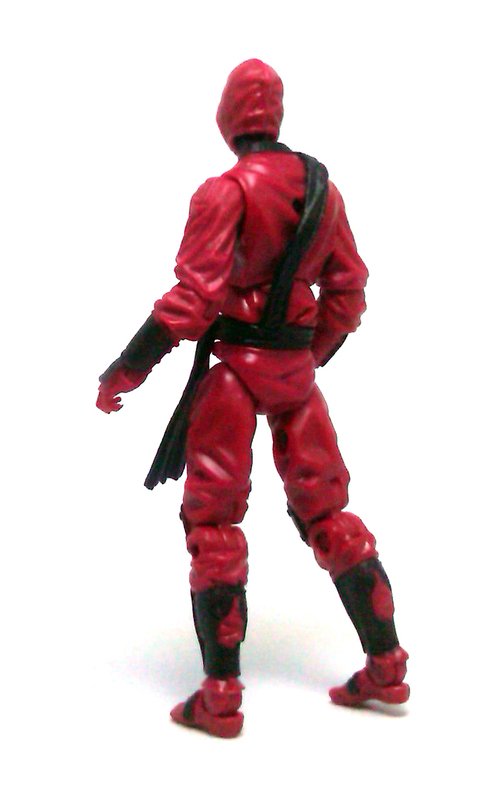 The Red Ninja comes with a black rubber sash across his chest molded with the belt piece, which works rather well to change the look of the base uniform. The hands are nicely sculpted, with a lot of individual fingers slightly spread as to facilitate interaction with a variety of ninja weapons. However, this brings me to the only point of contention I have with this figure. You’ll see, on mine, the left thumb is missing. 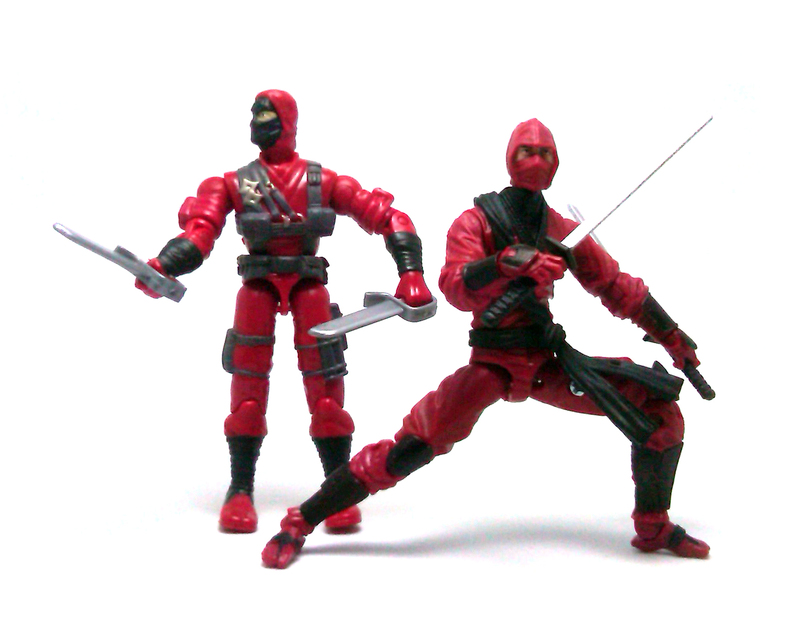 The wrist hinge design on the Red Ninjas is the more traditional sort, with the right wrist being able to bend in and out while the left wrist can move up and down. Fortunately, this time around the feet point straight forward on a resting stance. The Red Ninjas are molded in a deep red plastic, with solid black paint applications for the greaves, bracers and collar. The bare face area is painted in a rich flesh tone with neatly painted eyes. There are a few wavy paint edges on the uniform, but the overall look is good. 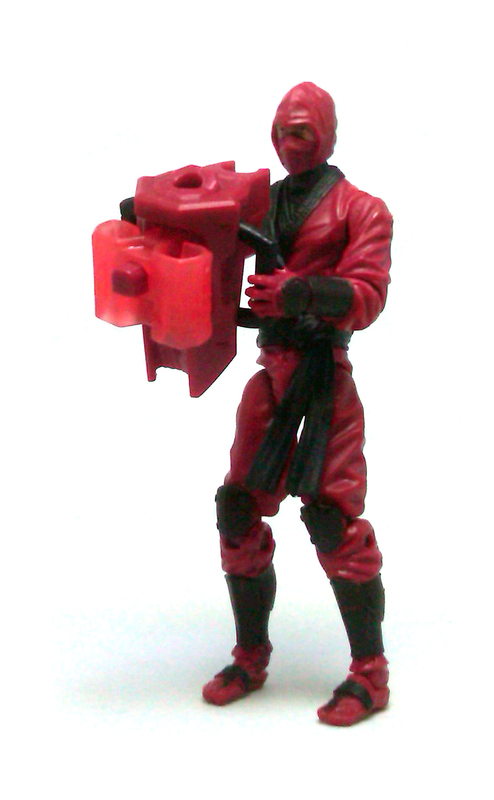 The action accessory included with the Red Ninja is a spring-loaded launcher with a clip to place it on the figure’s forearm and a few plastic loops to run the included zip line through. The zip line with the attached projectile are the exact same we have been getting oncluded with other Retaliation figures, only this time the clips at the ends of the cord and the projectile are molded in bright red. 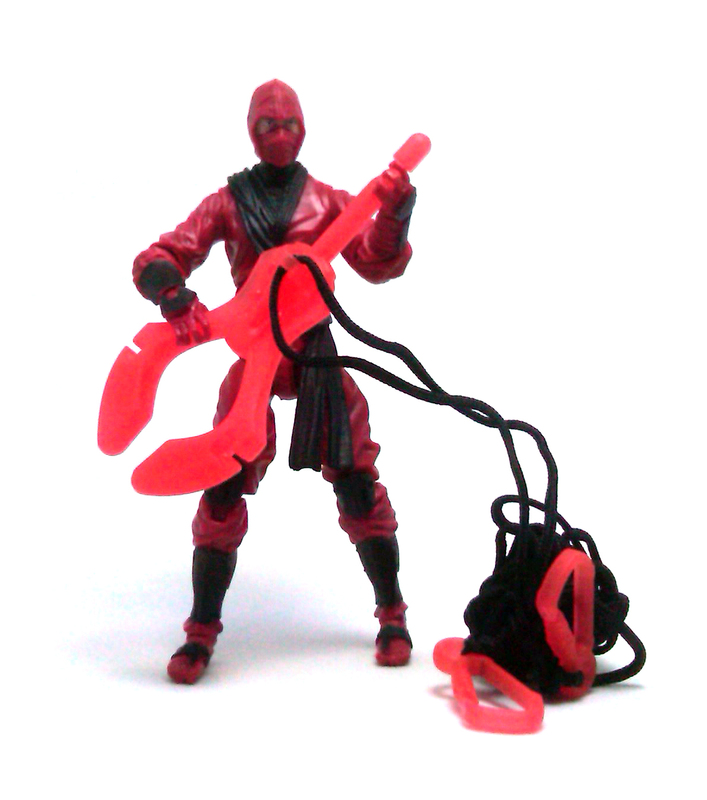 Other than the launcher, the projectile and the cord, the Red Ninja comes armed with a couple of identical katana, both painted in silver and black. Even with the missing thumb, the Red Ninja can hold his sword without much trouble, but it would have been nice to have a scabbard accessory for the blades. 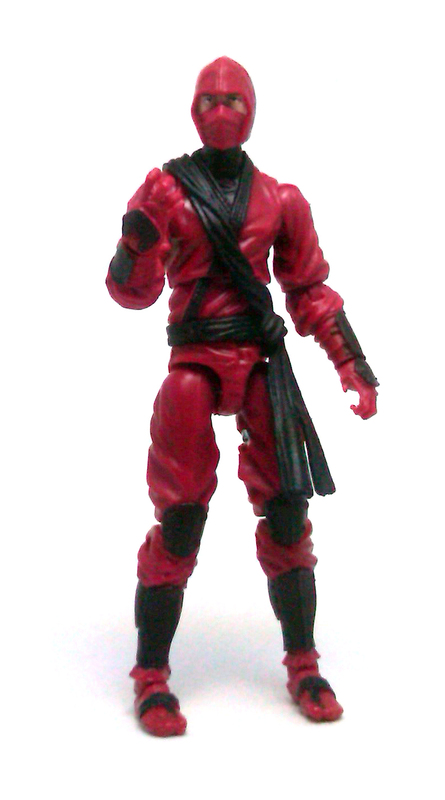 So, even though I was pretty bummed out by the thumb issue, the Red Ninja is such a cool figure that I went out and bought a second one, only this time paying extra attention to the hands.